Dini Enggar Fitri works as Deputy Manager, Planning Unit, The Bank of Tokyo-Mitsubishi UUFJ Ltd, Jakarta, Indonesia. 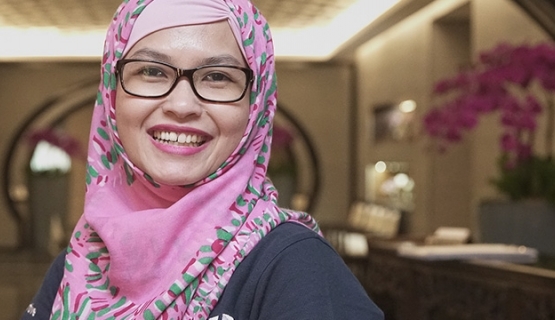 Dini Enggar Fitri joined a bank right after graduation, where she has now worked for eleven years. She lives in Jakarta, Indonesia. Dini Enggar Fitri completes the modules in Singapore, a couple of hours by plane from Jakarta. Learn more about the Aalto Executive MBA. The Aalto EMBA program is offered in seven locations: Finland, Singapore, Poland, South Korea, Taiwan, Indonesia and Iran. The fourth industrial revolution has begun, and it’s not managed from the corner officeThe fourth revolution of work has begun – how to manage people when work is changing? Fifty participants started their Aalto Executive MBA journey in HelsinkiAalto Executive MBA in Helsinki started on Friday with the orientation day. The graduation rate for the Aalto Executive MBA is 100%Intensive and goal-oriented learning can be combined with highly demanding career responsibilities. Learn, follow your ideals, be curious – and playAnnika Jyllilä-Vertigans gave the address of the graduate at the Aalto Executive MBA graduation ceremony on November 24, 2017.